This is a very impressive main course meal that is actually deceptively simple. Salmon fillets are cooked with spinach and a few seasonings inside a crisp, flaky pastry shell. Serve with a creamy butter sauce. Finely chop the onion. Heat the oil in a frying pan, then fry the onion until soft and sweet. 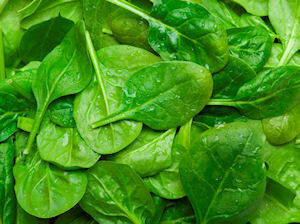 Add the spinach and cook until wilted, then season with salt, pepper and nutmeg. Divide the puff pastry into 4, then roll each block out to 20 x 15cm. Place a salmon fillet in the centre of each rectangle. Squeeze the excess moisture out of the spinach, then divide between the salmon fillets. Pick the pastry up and fold over the salmon, crimping over the top of the salmon so that it is fully closed. Beat the egg and brush over the pastry, poke a hole into the top of each parcel, then cook in a 200C oven for 25 minutes or until golden. Swap the salmon for another fish, such as cod or haddock if you prefer. Recipe serves 4. Back to the Spinach Recipes home page.